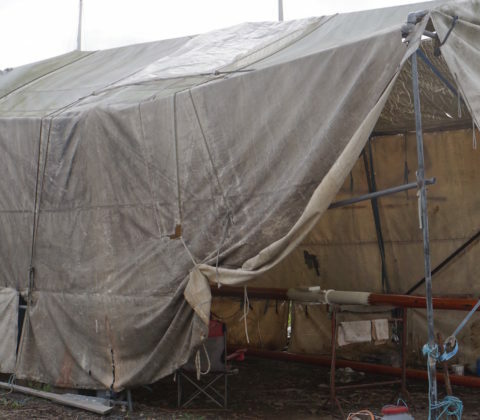 Now that the tent is empty, there’s room for the mast to be under cover. Two fellow berth holders volunteer to help move it inside, with a mast trolley loaned by Larkmans. The tent has to be dismantled, and it’s not before time! The lean is becoming more and more pronounced, and it seems unlikely to survive another big storm, but makes an ideal workshop to finish varnishing the mast as another bout of wet weather approaches. As Steve cleans up the mast and applies several more coats of varnish, Bev returns home to get the ‘other’ project up and running again after the summer interlude. There’s the plumber and plasterers to schedule in as well as sorting out the new floor. 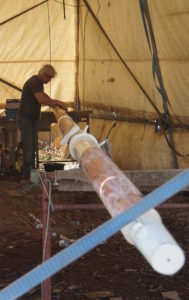 Steve finishes the mast, prepares the cross trees and gets the final bits of metalwork from Moray at BronzeWorks. 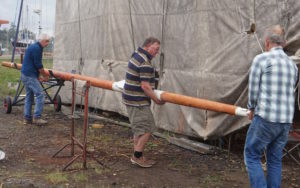 It’s agreed that the best way to get the mast in is to take the boat to Larkmans again, so James takes the mast by road and Steve works at Larkmans to get the mast ready. Eager not to miss the tide, and having re-calibrated the depth sounder, Steve sets off a little early to motor up river and spends a few moments in the Deben mud part way to Melton . . .